Victoria Park lies along Dufferin Avenue where it intersects with Clarence and Wellington Street in downtown London. Presently a park, the site has a larger footprint on the pages of history. 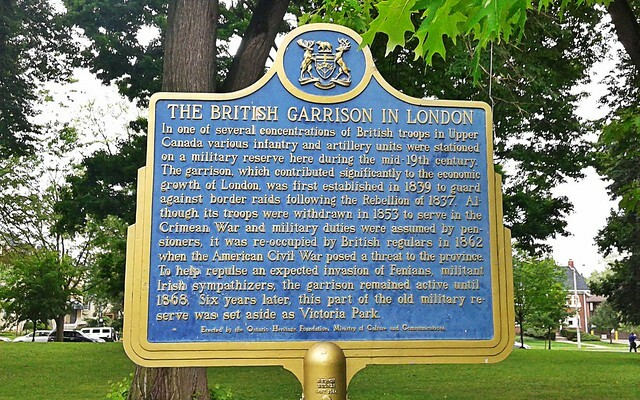 The site was originally a British Garrison and in case, my readers are wondering, there was an armed uprising on this part of the world as well, branded a “Rebellion of 1837” in Lower and Upper Canada. There was a garrison here comprising of British Infantry and Artillery Units at London District in mid 19th century. Along with a number of other memorials, there’s one for the Canadian Soldiers from London District who fought in South African Wars from 1891 to 1902 and to honour the ones who fell in the line of duty. In the afternoon walk in Victoria Park there were a lot many things familiar as I browsed a bit of history and paid my tributes to honour the ones who fought away from the homeland. A tribute to the soldiers for, dear readers, soldiery is a trait beyond borders. A tribute to the ones who fought away from the homeland and fell to rest in the faraway sands…. In the heart of down-town London (Ontario), The London Central Public Library is holding on to a secret. Annexed to the south eastern end of the library facing Wellington Street, what once used to be a parking lot is now a lush green oasis. 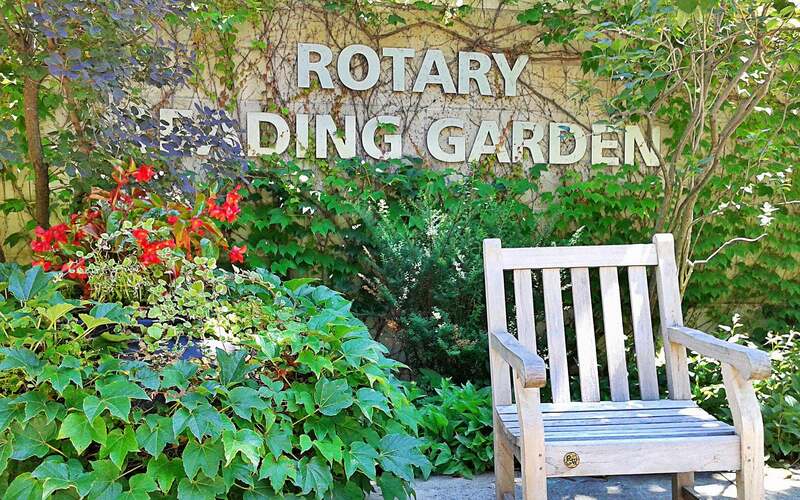 A mini paradise for the ones addicted to reading, we are talking about the ‘Rotary Reading Garden’. Monday through Saturday, until dusk, the garden is open to the reading, lunching, lounging and relaxing enjoyment of its visitors. It was a treat to be here, as I enjoyed my share of time in Martha’s Secret Garden and took a stroll along ‘Philosophers’ Walk’. 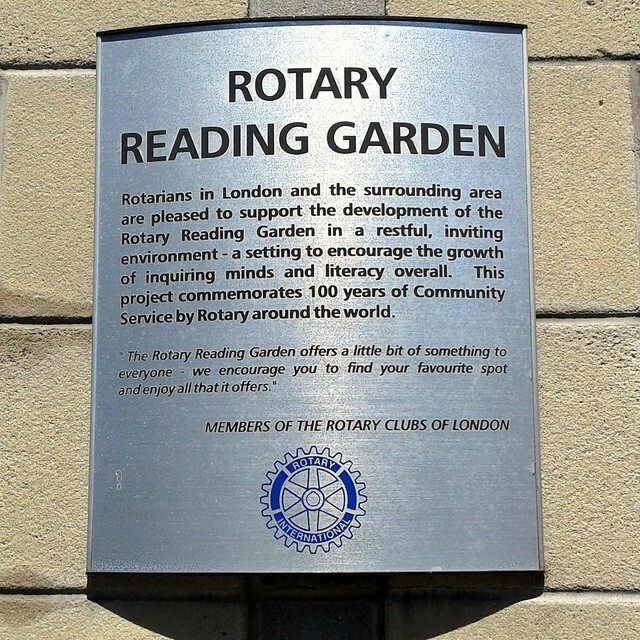 A gift to the inhabitants of London by the Rotary Club with a convincing statement; “The Rotary Reading Garden offers a little bit of something to everyone – we encourage you to find your favourite spot and enjoy all that it offers”. Nations that are alive stay connected to their literature and safeguard their reading habits at the cost of whatever it takes. Surrounded by the icons of commercialization this little piece of green is there to stay and will not be compromised for its shades offer that ‘little bit of something’ that we in Pakistan seem to have long lost on our devious path to forgetfulness……. Lavishing a swift break from work, I sat on the south-eastern corner of Dundas and Rideout streets, enjoying the view across the old Court House and Gaol up ahead to the Thames. The old Court House and the Robinson Hall built by architect John Ewart have been chronicled on varying times in the history of this beautiful city. The ground sloping to a rise and falling to a ravine, the river and the bog, the trees and the lush green, this landscape has endured a lot many transformations, the most significant of which was the great fire of 1845 starting from the stables of Robinson Hall and extending across the Thames. Robinson Hall was rebuilt and to this day stands as one of the prestigious hotels of London. 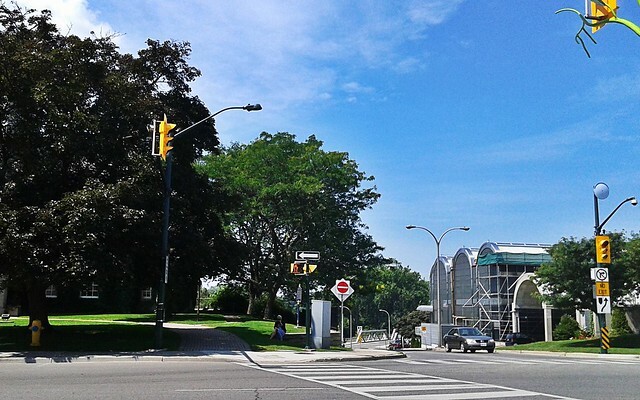 That afternoon, sitting at the junction of Dundas and Rideout streets, the component of my gaze captured in the snapshot outskirts the old Court House (towards the left of the picture obscured by trees) and extends up ahead to the old bridge on Thames and falls back to the Museum of London (extreme right). With historical references on London’s architecture and landscape printed on that junction, I enjoyed a glance in the present times savoring a taste of the flashbacks from the past. And the Robinson’s Hotel (erstwhile Robinson’s Inn), dear reader, was on my ‘full right and back’.